I have frequently considered getting a recumbent tadpole to deal with the windy conditions I face on a regular basis. Too often have I been hampered by windy conditions. Facing 20+ mph winds is quite regular. Is it worth it? I am specifically interested in the tadpole design because of the stability. A 2 wheel recumbent would get blown over just as easily, if not more easily, as a normal bike. And yes... I have regularly fought against being blown over. But I don't know if it would be worth it to get a recumbent trike to deal with the high wind conditions that I face. That's the question. Is it any easier? Help from a trike rider with experience riding in high wind would be very appreciated. There is a definite aerodynamic advantage for head and cross winds, and certainly stability is improved; however I am not sure that would be the main reason that I would buy a recumbent trike. Trikes are heavier and recumbents don't climb as well so it would be an expensive experiment to only find that other qualities counteract the aerodynamic advantage. Perhaps the best advice is to find a local shop (or owner) who could give you their impressions of trikes in your environment - and maybe allow you a few test rides. There are fairings available for additional benefit; however some report that they don't do as much as you would expect. I reckon if where you live has relentless strong winds you have to manage them somehow, but is is really that bad? Unfortunately I do not have the option to test ride. I ride 2 wheel and 3 wheel bents as well as uprights, and in very high wind conditions I prefer to ride the trike because its more stable and you do feel the wind less., making the ride more enjoyable. A row of shrubs or a low embankment is all a low trike needs for a windbreak. However, the trike is not faster than the uprights in such conditions. If the route is not too terribly hilly, speeds will be pretty similar. If speed is the goal, I would choose a two wheeled bent. I don't find my 2 wheeled bents to be more sensitive to sidewinds than my uprights. Speed is not the goal. I am simply trying to go about 50-60 miles without being completely exhausted in one direction or the other because of the wind speed. While I love a good tail wind, a strong head wind can really destroy your morale. Being lower to the ground should theoretically reduce the drag, in addition to the benefit of a reclined position also offering (again in theory) more drag reduction. I am not concerned about weight. I am used to riding heavier bikes. One of my first bikes weighed about 45 pounds. A low end recumbent trike probably weighs about that much. Hill climbing doesn't matter, because with three wheels you can tackle nearly any slope. You'll go slower, but the stability you have with three wheels means that your slow speed isn't an issue like it would be if you were on two wheels. I think side winds are more treacherous on a two wheeled recumbent because of your body position. Is that not correct? Let me know if you have experience. Speed is not the goal. I am simply trying to go about 50-60 miles without being completely exhausted in one direction or the other because of the wind speed. I am not concerned about weight. I am used to riding heavier bikes. Hill climbing doesn't matter, because with three wheels you can tackle nearly any slope. Sounds like you've talked yourself into it. Great! I have an ICE Sprint and can attest to an aerodynamic advantage. I don't notice any stability/tracking effect from cross winds. Maybe that's related to the 3 wheel platform or more likely related to speed. The faster you go, the apparent wind direction moves from the side to more from in front. If you sail, you will understand the apparent wind effect. Basically the wind vector factors the real wind speed and direction with your speed and direction. Tracking is more of an issue in cross winds. You won't get blown over on an upright 2 wheeler, but you will get pushed to the side. How much is related to the apparent wind vector and the "sail" area you present to it. I've ridden my upright bikes in strong gusty cross winds and manage it by allowing more distance on my lee side for when I get pushed that direction. Bridges are the worst because wind tracks through the valleys and is quite strong, plus there is limited space to the side to maneuver. Hope this helps. I recommend you post your questions to the BentRiderOnline forum. It's more focused to your interest and likely will get you more insight. What trike(s) are you considering? Meh. In a headwind I expect to go slower. It only wipes me out if I try to make my normal speed into it. That takes more power no matter what you're riding. In a way, riding a trike is like having a headwind all the time., because you WILL go slower for a given power output. That means more time spent at your chose exertion level. It's also true that headwinds won't affect you as much as on an upright. The same features that produce speed also produce efficiency. Trikes, in general, are neither fast nor efficient. From my experience, the penalty is very real and measurable. 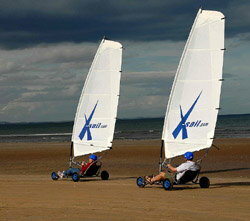 Trikes are more mentally relaxing to ride in strong wind conditions, but they require additional physical effort overall. 1. I am really slow on the trike. 13-13.5 mph on the trike at the same effort on a fixed gear I would be doing 15-15.5 mph and 17-17.5 mph on a geared bike. 2. I have difficulty getting my heart rate elevated. At 13-13.5 mph my HR may be 68-72% of max. At the same effort on a DF bike it is 80% maybe a bit more. I don't know how much is due to position of heart to legs on the trike and how much is maybe my legs just can't move a bigger gear fast enough to elevate the HR compared to a traditional bike. 3. If you want to beat the wind you need a very aero position. My Dumont seat angle's lowest position is only 42 degrees. A "racing" trike like a Catrike 700 or ICE VTX is 25 degrees and a Greenspeed Aero is 20 degrees! With these low seat angles I don't think a faring will help much to increase speed. These trikes should put you into a real time trialing cheating the headwind position. But these are rigid frames and some folks don't like the laid back seat angle and getting in and out of these very low trikes. They are build for speed, not comfort. 4. Compared to a traditional road bike, a "fast trike" may be a case of a "fast turtle". 5. I am strongly considering getting a e-assist electric motor with a torque sensor and use a lower levels of assist. I know I will go a lot faster but if used properly it will allow me to get a better workout by getting on top of a bigger gear at higher cadence much like riding with a strong tailwind. I can sit in the back of my Saturday morning group averaging 17-18 mph and keep up on the trike. I think a race trike without e-assist will only get me up to 15.5-16 mph-just guessing, not sure. I concur bentridersonline it the web site for all you want to know about bents generally and trikes specifically. I'm interested in getting a folder. I store my bikes inside with me. Having experienced more than one of my bikes being stolen, I don't feel secure about having them anywhere else. With a folding trike, getting it through the door would be easier, and keeping it out of the way while it's inside will also be simpler. ...unfortunately, they still aren't selling these things yet! I think it's the best fold I've seen. I want one. I haven't really figured out what else I'd get. Catrike and ICE have folding models. All the ICE Sprints and Sprint Xs fold. I understand the seat has to be removed and reinstalled. How important is suspension system? Both ICE and Catrike have folding models with suspension. Suspension is expensive and adds weight but more comfort if riding uneven or rough surface. You started your post with riding easier in strong wind. Unless you get a low seat angle or find a fairing that significantly reduces wind resistance you will not ride easier into a strong head wind. As I stated above the Dumont which folds has a SA of 42 degrees. A ICE Sprint with a hard shell seat will go as far back as far as 28 degrees and it folds. You can buy the ICE with or without suspension which is expensive on a ICE. If money isn't a factor get the ICE Sprint 26X hard shell seat with the Shamino STEPS e-assist motor and there will not be any wind! All these beast are a compromise. Determine what is the most important feature you want. A great folding trike that sits you high into the wind isn't going to help with the 20 mph headwind if that is your main goal. The more laid back the seat on a trike, the less frontal area exposed to the wind. I have two trikes, a Greenspeed GTO with a fixed angle seat at about 45 degrees and a Catrike 700 with a fixed angle seat at 27 degrees. It makes a difference which one I ride in windy weather. In any case the lower profile makes either trike easier to ride in high wind conditions compared to a road bike. I doubt any wind you would want to brave would tip either trike. I rarely ride in really windy weather because it is less pleasant and because high winds mean dust blowing around the valley so anything you gain with exercise is compensated by breathing unhealthy air. It can sometimes get so bad in really high winds that you can feel the grit on your face. The Evolve Trikes look interesting. The folding process is remarkable. From the video, it looks like they have 16" wheels, which will reduce the folded volume but also negatively affect the ride. My ICE Sprint folds the rear wheel up and 90 degrees so it lays on the cruciform joint. The seat has to be removed first, which is not a big issue, but you then have to put it somewhere. I was able to stow it in the trunk of a Toyota Camry with not much effort. Mine has rear suspension. I think it is a good thing, but I have not had a chance to ride a trike without. Again, I think testing a few trikes is the best idea, even if you have to drive a few hundred miles. Just saying, unless the recumbent bike is some kind of streamliner, i.e. with a fairing and/or wheel covers, the amount of surface presented to cross-winds is no more than that of a DF roadbike. I would not expect 20 mph winds to be dangerous on a recumbent bike. 40mph, now that would be interesting, but I suspect that even a trike would find that challenging. Bottom line, there would have to be a lot more in it than just the wind issue to make me accept the other disadvantages of a trike vs bike. I don't know where you live but, since you're talking about a folding trike, you are probably up into the $3,000 price range new. To me, that makes a road trip to a recumbent specialty shop well worth while. It isn't just the test ride, a recumbent specialty shop will also be able to advise you on the other issues of trike ownership like folding and fitting it through a doorway. By the way, a 32" door only opens to 32" when the door is open all the way parallel to the wall.